In Week 2 of our Crime & Punishment season we’re focusing on the second stage of the justice system: the trial, conviction and appeal process. We’ll be publishing fascinating new articles, from a discovery of 24 criminal ancestors in one family tree, to the life and times of the ‘Celebrity Hangmen’ of the Victorian period. We’ll be delving into the murky world of criminal gangs, with the exploits of Dublin's notorious gangs and those from further afield. There’ll also be some helpful guides to interpreting the records in relation to your own tree. We’ve uncovered a particularly fascinating example in our collection: the case of Edward Ball, a man sentenced to death for the forgery of a five pound note. We’re also exploring our Registers of Criminal Petitions, which were usually initiated when a judge’s report did not recommend mercy to a condemned prisoner. 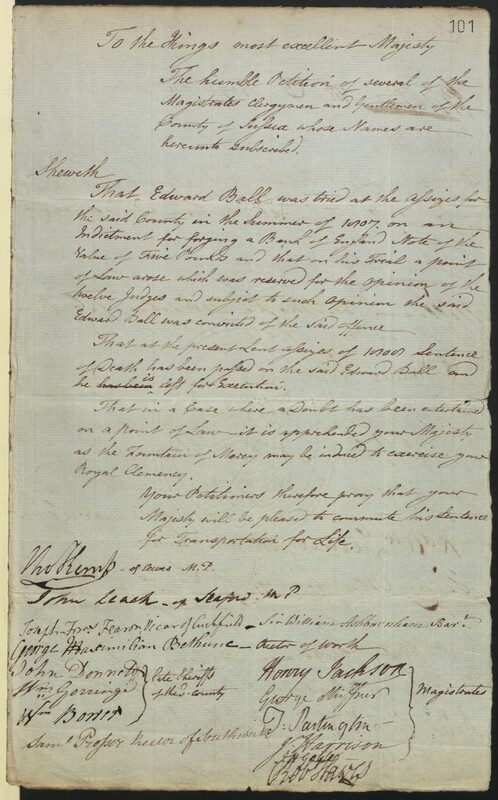 In the case of Edward Ball, his petition was started as a result of his death sentence. 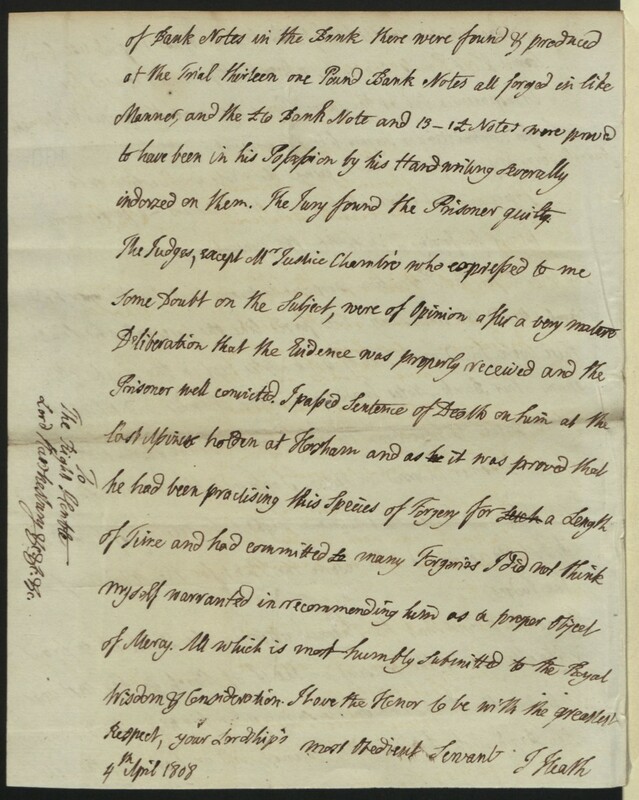 Signed by a collection of “Magistrates, Clergymen and Gentlemen of the County” and addressed directly to the king, the petition asks for a pardon for Ball on the basis that he was an artist and not a forger. 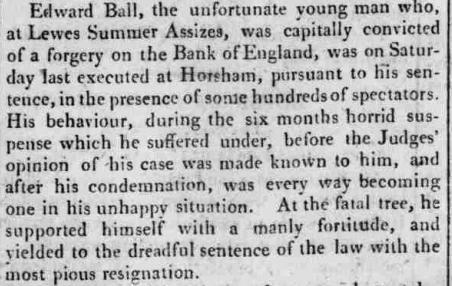 Unfortunately for Ball, they were unsuccessful, and he was executed on 16th April in Horsham in front of a crowd of “hundreds of spectators”. The Hampshire Chronicle printed an article about his death. https://www.findmypast.ie/Pay?isfreetrialrequest=true">Start a free trial today and uncover your family's murky past! If – unlike Ball – your ancestor was sentenced to prison, you can explore our Criminal Entry Books (HO13) to follow their journey. They’ll tell you if your ancestor was moved to another prison, was pardoned, or joined the Army or Navy to escape their sentence. It also contains correspondence to and from crown officials and the convict’s family and friends, so like the appeals, the records offer a great opportunity to trace the extended family of a convict. Have you discovered any surprising stories, tragic miscarriages of justice, or despicable characters? We’ve really enjoyed the selection of sheep-rustlers, brigands and highwaymen you’ve told us about already! Share your stories in the comments section below.